Ever since I moved to San Francisco more than five years ago, I've had numerous friends suddenly decide to drop in for a conference or vacation. I've probably walked Golden Gate Bridge 30 times already and I'm rapidly improving in my role as amateur tour-guide :-) My tour of the city is, of course, highly influenced by my likes and dislikes. In my opinion some San Francisco "attractions" (as they are defined by most travel guides) are overrated and definite tourist traps (I'll include Fisherman's Wharf and Ghirardelli square here - although if you're in the market for kitschy souvenirs and trinkets, this is your best bet). Some "attractions" I really like, for example the Golden Gate Bridge, Alcatraz, the sea lions at Pier 39 and the cable cars. But in my opinion what makes this city one of the most beautiful cities in the world is the landscape. The steep streets, the ocean, the bay, the rolling fog. Because San Francisco is located between the bay and the Pacific Ocean it has almost an awesome view from everywhere. Ah, and there is the fog. Lots of it, especially in the summer. If you don't mind the cold, the fog means lots of great photo opportunities. Any time of year is a good time to visit San Francisco. But if you want the best weather I think late September and October are the best months here. 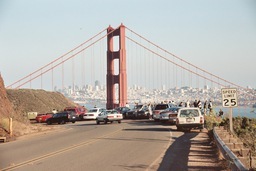 Most tourists come to San Francisco in July/August, which brings me to another topic. Most visitors coming during the summer expect to find sunny California, the land of sunshine and beaches... And that is true if you leave San Francisco and go south a little; but San Francisco is a microclimate with fog and winds, never predictable. When it's sunny everywhere else in California it is mightily cold in my city, and vice versa. Also, it can be cool in one part of the peninsula, and warm in another. I can't tell you how many times I've seen groups of shivering tourists, huddled on a street corner trying to stay warm. Especially if you will be by the water (wharf, beach etc), a windbreaker or a sweater is a must. You may also want to know that public transportation is good, just about everywhere in the city is covered by a bus or trolley route. On a different topic, San Francisco is a very diverse city, you won't stand out no matter where you are from originally. Final thought: looking out the window it's usually the best therapy for me in liking this city. Sometimes I get frustrated with the fog, the cold summers, the rent price, the impossibility of finding a parking space etc. but then I look out the window and everything goes away. I'm in love with this city again.